When I sit down to read a new book of poems, my immediate urge is to do what most people I know do: flip through the book and look for the poems that catch my eye. Sure, I know that a book of poems is ordered for reading, but that doesn’t stop me. I eventually make it through the entirety of the book in this nonlinear way of first-reading that kind of lets me absorb the book in simultaneity, skipping around to get the overall gist of the book before going through with a sharper, deeper look. Yet upon opening Aimeé Baker’s debut book of poetry, I found myself unable to skip around like usual. 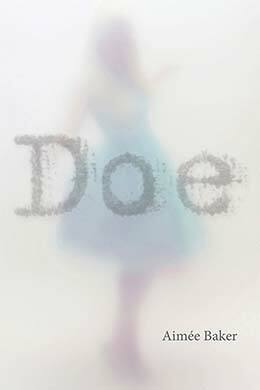 Doe, winner of the 2016 Akron Poetry Prize, is a book of poems about women who have gone missing or whose bodies remain unidentified in the United States, each poem grappling with questions about who these individual women are and what happened to them. And there are lots of women — about seventy-five from cover to cover — each poem labeled with a place, date of disappearance or discovery and a name, where possible. These are poems of witness, bravely facing the gruesomeness of their subjects as they attempt to erase the silence that surrounds these women’s lives and fates. To skip around in this book is to ignore its basic premise — that we must pay attention to these stories. Throughout the book, where the poems implement narrative, they are also intensely lyrical, and as such they don’t really document the stories of women like Hossencofft in a traditional narrative sense — to be fair, a blow-by-blow recounting of the abduction is probably impractical because the missing pieces of each story, bodies and names that are crucial for an accurate accounting of events. And reliance on narrative would make for poems that are not nearly as rich and deep as those in Doe. In clumsier hands, a book like Doe might come off as gimmicky or voyeuristic or melodramatic — or worse, exploitative of what has befallen these women. In truth, these poems sometimes play with imagery not unlike that of a horror flick. But then the horrific world of Doe is one in which women are in constantly peril of losing their lives, their bodies, their whole selves. Baker’s poems are not cautionary tales or grisly reenactments, but they do remind us that the awful world these women lived in is the same one we live in. They introduce us to those who are gone from the world and ask us to observe their absence, to ask where they are now. W. Todd Kaneko is the author of The Dead Wrestler Elegies (Curbside Splendor, 2014). His prose and poems have appeared in Bellingham Review, Los Angeles Review, Barrelhouse, The Normal School, The Collagist, and many other places. He has received fellowships from Kundiman and the Kenyon Review Writers Workshop and lives in Grand Rapids, Michigan, where he teaches at Grand Valley State University. Visit him at toddkaneko.com.